If your belly feels a littler bigger than usual, don’t freak. 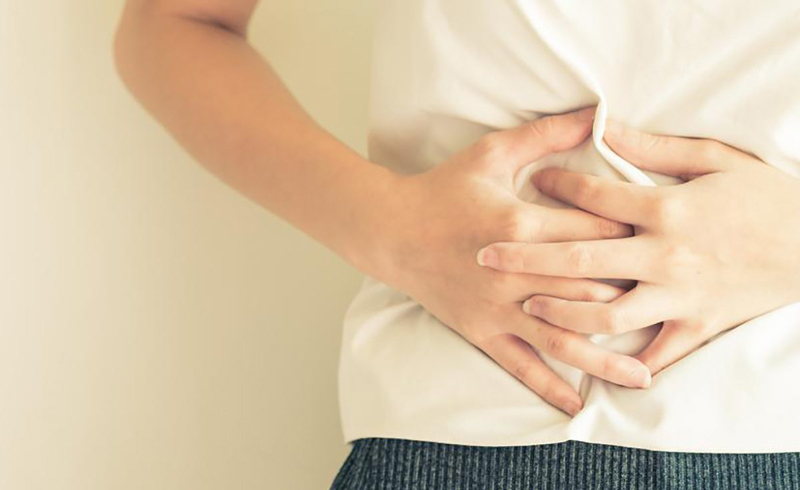 “Unless it’s associated with weight loss, nausea, or vomiting, bloating is very common and usually not worrisome,” says Robert Burakoff, MD, clinical chief of gastroenterology, Brigham and Women’s Hospital. It’s often nutritious foods that could be the culprit of a little extra air in your tummy. Chowing down on beans, Brussels sprouts, cabbage, apricots, or carrots can lead to bloat, says Gina Sam, MD, director of the Gastrointestinal Motility Center at Mount Sinai Hospital. Foods high in lactose, dairy’s main sugar, and foods high in fiber, which can lead to the release of bloating gases hydrogen and methane, can puff you up too, says Dr. Burakoff. You’ll find the sugar substitute sorbitol in diet soda as well as in certain sugar-free foods and drinks and certain foods marketed as “diabetic.” Snack on this stuff enough, though, and you’ll notice your pants tighten up, says Dr. Sam. Even the sweetener Splenda’s website states “sugar alcohols (such as mannitol, sorbitol, xylitol, lactitol, and maltitol) are sometimes a cause of bloating and diarrhea if too much is eaten.” Your best bet is to cut back on the sweet stuff, fake or not—even real sugar can puff you up, says Dr. Sam. Sweet, refreshing, thirst-quenching—and bloating? Certain fruits, like watermelon, apples, pears, and mangoes, have a high ratio of fructose to glucose (both sugars occur naturally in fruit). This can cause gas and bloating in the estimated one in three people who has difficulty digesting fructose. If this is you, stick to fruits with a more balanced fructose-to-glucose ratio, such as bananas and blueberries. If you’re all backed up down there, your gas likely is, too—which could leave your belly feeling heavy, says Dr. Sam. Check your diet, make sure you’re hydrated, and keep up with workouts—but if you feel any abdominal pain, make an appointment with your doc to make sure something else like irritable bowel syndrome (IBS) isn’t at play. “When you experience fight-or-flight symptoms, like a racing heart, your body diverts blood flow away from your GI tract, which slows down digestion,” says Dr. Levine. Heavy breathing, which occurs when you’re under stress, makes you swallow more air than usual and can also lead to bloating. To feel better, simply change your breathing pattern so you exhale for a few counts longer than you inhale. Bloating is one of the most common symptoms of IBS—a disorder that’s characterized by stomach pain and a change in your bowel habits (usually diarrhea, constipation, or both), according to the International Foundation for Functional Gastrointestinal Disorders. It affects between 10 and 15 percent of the population. If you notice these symptoms, see your physician—treatments range from lifestyle changes to medications. 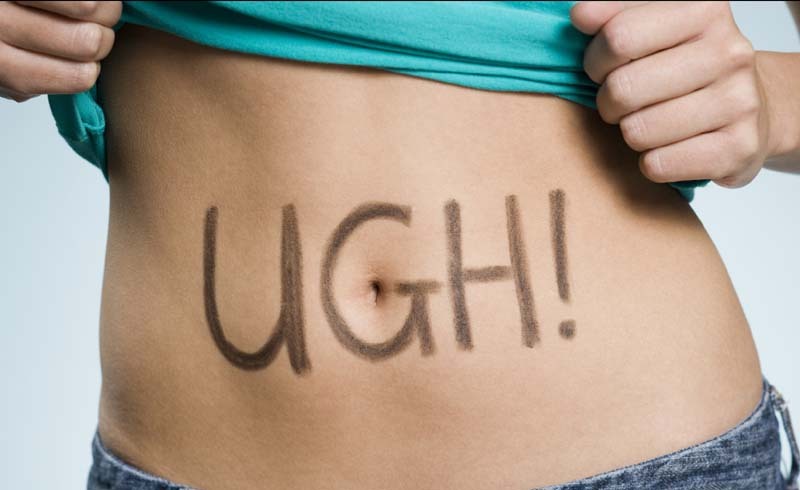 If you’re dropping weight, feel nauseous, are vomiting, have a fever, and are bloated, doctors may worry about Crohn’s disease, a chronic inflammatory bowel disease, says Dr. Burakoff. The condition can be mild or severe—it’s best to check in with your physician if you’re noticing a slew of symptoms in addition to bloating. While bloating is likely related to something completely normal and treatable, when accompanied by symptoms like blood in the stool or weight loss, experts do consider more serious diseases like pancreatic, ovarian, or stomach cancer, says Dr. Sam. But before you let your mind wander (and end up in a WebMD panic attack), consider your lifestyle and make a real-life appointment to play things safe. Let a doctor—not a website—make that decision for you.